The Avenue of Stars (星光大道) located along the Victoria Harbour waterfront in Tsim Sha Tsui, Hong Kong (香港尖沙咀海�I花�@). 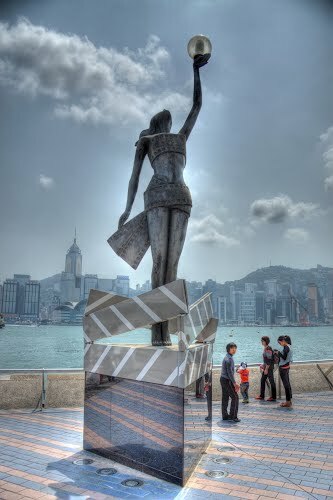 A 4.5-metre-tall replica of the statuette given to winners at the Hong Kong Film Awards greets visitors. The Avenue of Stars is a 400-metre long stretch of waterside boardwalk opened in April 2004. It cost HK$40 million to construct, was designed by local architects AGC Design, financed by New World Group and supported by government bodies including Hong Kong Tourism Board, Hong Kong Tourism Commission and the Hong Kong Film Awards Association. These images were taken from online picture galleries - other fans photo galleries. I have been on the boardwalk once a few years back. The harbor view was quite nice. The celebrity handprints seem to be quite small. I had wished they put up a picture next to the handprints. Because it's so near the harbor, there are quite a bit erosion due to the salty air.